Um, what? Surely, this is just some gimmick to get me inside, right? 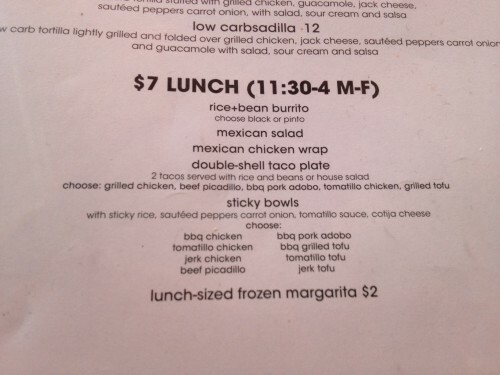 There’s no way that Blockheads, with their bigger-than-your-head burritos, could be serving any of their regular menu items for just $7. Well, I had to know for sure… the next day, I grabbed a co-worker and we went during our lunch hour. Obviously, the lunch special is limited to a very small section of the menu, but it’s actually not as bad as I expected. Between the tacos and sticky bowls, there are plenty of meat options, and some dishes even come with rice and beans on the side. 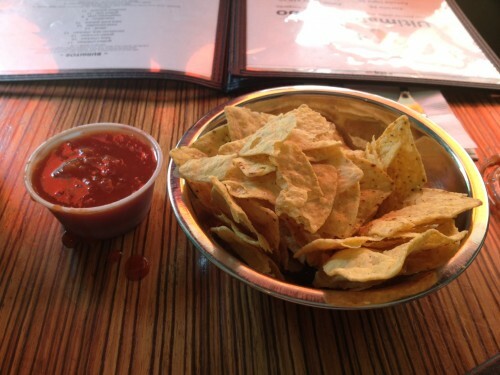 Also, regardless of what you intend to order, every table is served chips and salsa right after being seated. Nice! 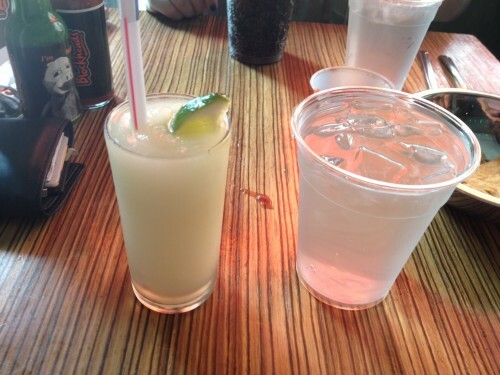 I’ve never been one to refuse cheap booze, so I felt compelled to order the $2 “lunch-sized” margarita. It can’t hurt to knock back a couple drinks before returning to the office, yeah? Well, hmm, maybe that depends on what you do for a living. Anyways, this thing was served in one of those skinny cocktail glasses, except shorter than normal. It seriously wasn’t much bigger than a shot, but it sure was tasty! 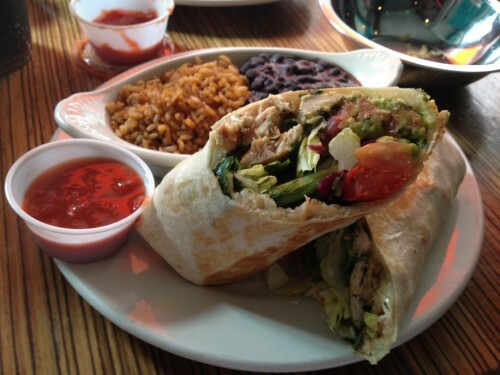 For my main meal, I ordered the “Mexican Chicken Wrap,” which had grilled chicken, cheese, lettuce, tomato and guacamole, served with salsa and rice and beans (black or pinto) on the side. When my food first came out, I was in disbelief at the $7 price. This looked like an actual entrée from an actual restaurant. Awesome! The chicken was hot and had a Tex-Mex flavor to it, the lettuce and tomato were fresh, the cheese was plentiful, and the guacamole was chunky and delicious. The black beans and rice were perfectly fine also. Everything tasted just as it looks… pretty good! I don’t think you’re going to find the most authentic Mexican food or burritos at Blockheads, but this meal is good for what it is. To put things in perspective, a comparable chicken wrap at Toasties would cost you something like $8.25 before tax, and that’s without any chips, salsa or rice and beans. My co-worker ordered the rice and bean burrito. 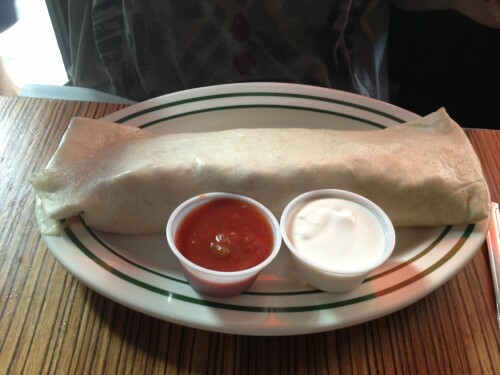 I didn’t have any of it, but I was pleased to see that it’s the same size burrito as any from their regular menu. As mentioned before, the burritos at Blockheads are absolutely humongous, and for $7, this is a killer deal. Unfortunately, the lunch menu is available for dine-in only, so that means you’re expected to pay tip on top. However, even after tax and a 20% tip, you’re still under $10 if all you order is something from the lunch menu (which includes chips and salsa, waiting service, and plenty of free water). 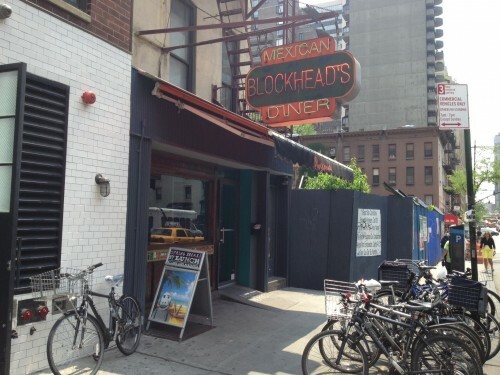 Out of curiosity, I called the Blockheads at Worldwide Plaza (50th Street between 8th and 9th Avenues) to see if they had the same deal, but their lunch menu is apparently $10 per item. 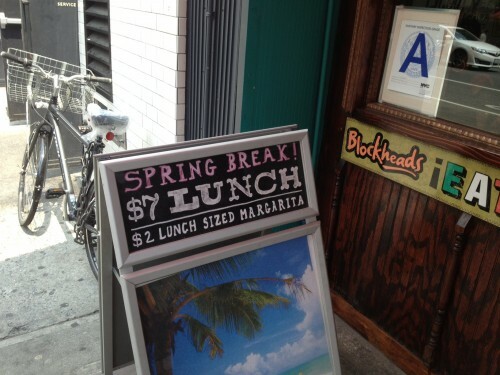 So, as far as I know, the 2nd Ave Blockheads is the only location with this offer. Eastside Lunchers, this one’s for you! Posted by Chris Thompson at 11:30 am, June 4th, 2013 under Blockheads.